This protect ultra wheelchair cushion uses high residence foam and aqueous gel center to redirect and distribute pain pressure points. The soft resilient medical grade foam is durable and will not break down over time when compared to traditional polyurethane foam. This molded cushion is designed for superior positioning and protection and uses a combination of foam and gel to create the ultimate wheelchair cushion. Low sheer nylon cover is removable and washable. This protect ultra wheelchair cushion uses high residence foam and aqueous gel center to redirect and distribute pain pressure points. The soft resilient medical grade foam is durable and will not break down over time when compared to traditional polyurethane foam. 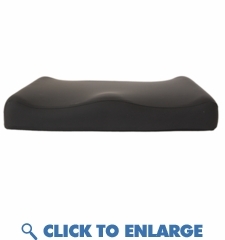 This molded cushion is designed for superior positioning and protection and uses a combination of foam and gel to create the ultimate wheelchair cushion. Low sheer nylon cover is removable and washable. Molded high density pressure sensitive foam. Soft foam allows immersion of pelvis for comfort and stability. Medial and lateral side supports facilitates positioning. Trochanter cut outs facilitates proper pressure redistribution. Safety strap keeps cushion in place. Stretch nylon cover is low shear and breathable.